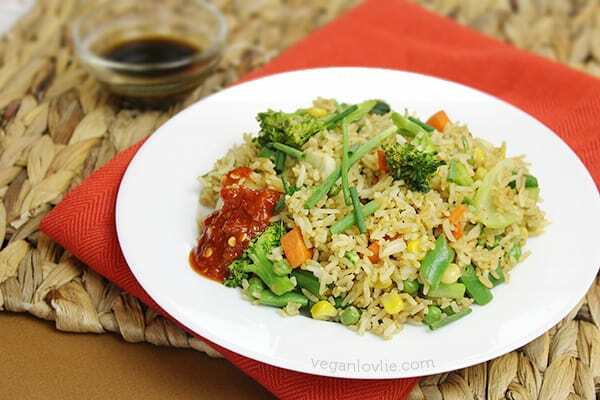 Easy vegetable fried rice made with less than a tablespoon of oil – healthy tasty low-fat vegan fried rice recipe that can also be made with frozen veggies. When I was in my early twenties, and had not yet met Kevin (aka Boyfriendlovlie), I made a wish. 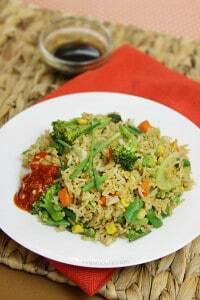 But before I come to that wish, today is a little bit of a special post as Kevin is sharing his temptingly tasty recipe for a low-fat vegetable fried rice. You’ve already seen his comfort cuisine with this 30-minute butter bean curry and his mouthwatering stir fried spaghetti. Some of you have even tried his recipes with success. I must admit, this is one of the best vegetable fried rice I have ever eaten. And I am not saying this just in case he might be reading this (he doesn’t really read my blogs). But if you try his recipe (or even if you don’t), please leave us a comment. He will be thrilled. Indeed, that is one thing that he does regularly – asking whether I’ve received any new nice comments. Being no exception, I think every blogger is cheered up by the comments they receive. Are you not? This recipe works best with cooked rice from the day before that has been left in the refrigerator. 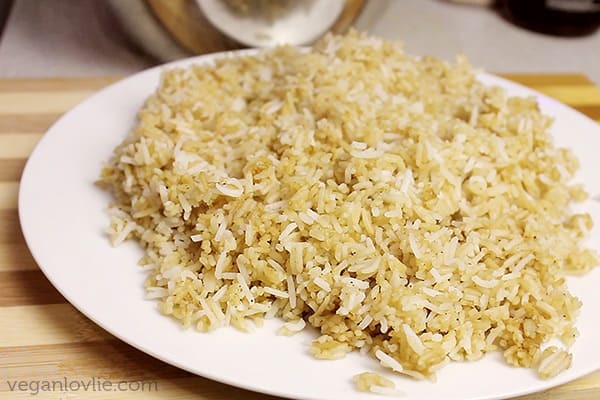 But, if you don’t have any cold leftover rice and are dying for some fried rice then you may find Kevin’s technique to work around this quite helpful. First we really recommend that you use a non-stick wok or pan as this will help to keep the oil content low. After the rice is cooked and completely cooled, he adds it to the pan (with just about half a tablespoon of oil) in three batches. Stir frying the first batch until the rice is no longer moist ensures that each grain will be coated in a little oil before adding the next batch. Also, adding the soy sauce in stages creates different colour tones in the rice that makes the final dish more interesting and attractive. So what wish did I make? Well, believe me or not, I wished to have a life partner who would enjoy cooking just as much as I do. If we can feed each other with good food made with love, the road ahead will be a lot more pleasurable. And I think it is somewhat true, at least in my case. 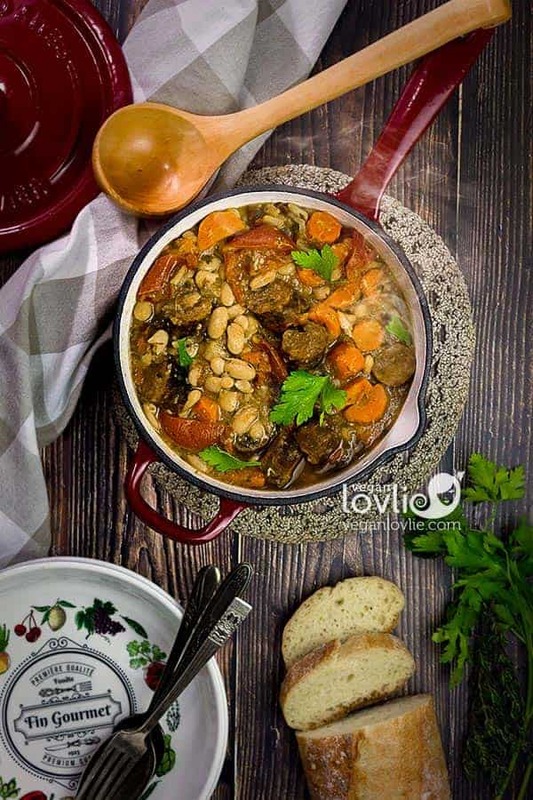 Women just as much as men do love their partner to cook them something nice from time to time; don’t you agree? It turns out my wish came true, although Kevin was not initially accustomed to cooking when we first met. Through the years, he kept at it and even had a small notebook to jot down my hurried instructions or saved recipes that he would find online (I was not yet on the blogosphere at that time). He would sometimes get the spices wrong as I never used to label any of them before; I knew what they were by their smell, colour and texture. However, for him it was quite hard to make up what name belonged to what scent; he thought a lot of them looked the same. So, I started labelling them, English with Creole (Mauritian dialect)/French translation. I still label most of the spice jars until today because I think they just look prettier this way. But he also learnt a lot through his own experimentation until he started to surpass me in many dishes – especially the stir fried ones. 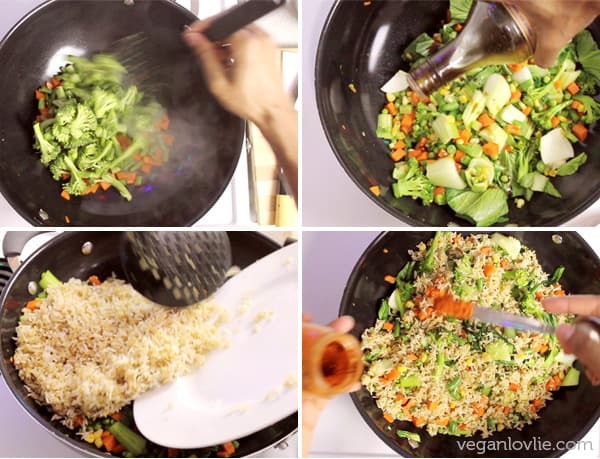 See Kevin in action in the video as he makes this delicious low-fat Vegetable Fried Rice. When he is not cooking, he makes some mad illustrations. 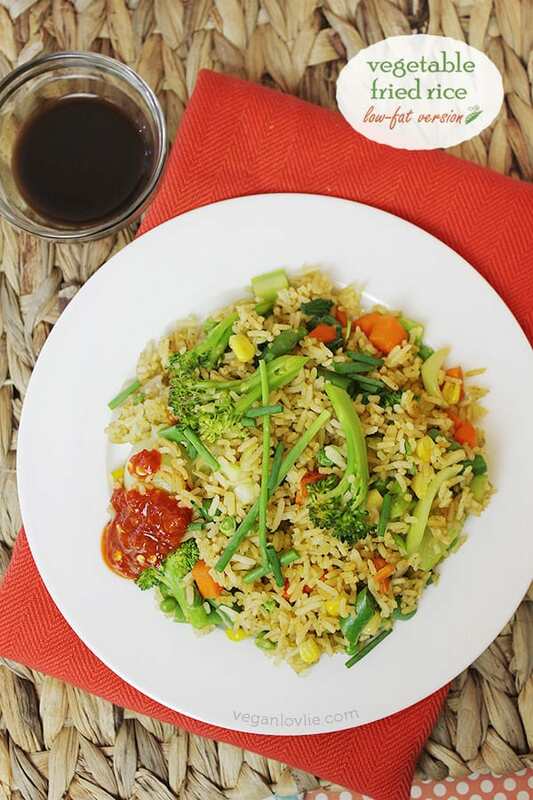 An easy healthy tasty low-fat vegetable fried rice made with less than a tablespoon of oil. Rinse the rice a couple of times until the water is clear. Drain and place in a saucepan (preferably non-stick). Add 2 1/2 cups water. Cook partially covered on medium heat until all water is absorbed and rice grains are still a little firm (about 15 minutes). The rice should not be mushy, sticky or overcooked. 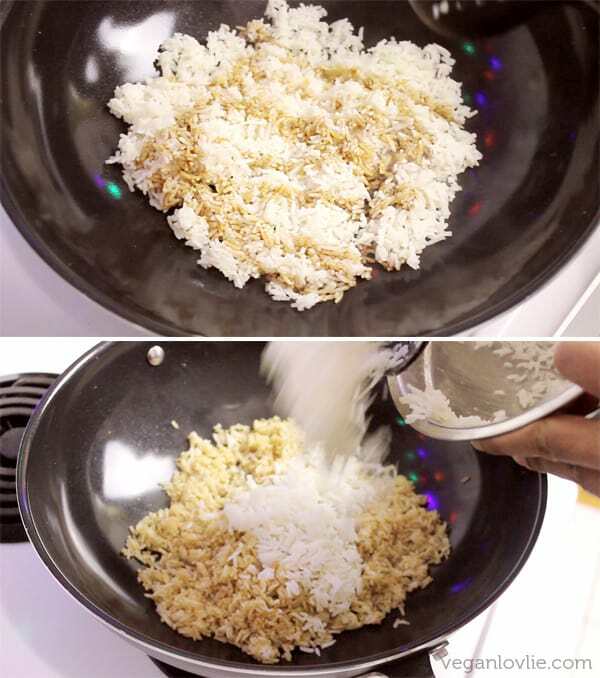 Remove rice from the pan and lay in a plate or large bowl. Leave it to cool completely before using. Fluff it with a fork once it’s cooled. Meanwhile, you can peel and dice the carrots, cut the broccoli into florets and dice the stem. Cut the green beans into small pieces. Separate the leaves from the bok choy and cut into small pieces of 2 inches (5cm) in length. Once rice is cooled, add 1/2 tablespoon coconut oil in a non-stick wok or pan on medium heat. 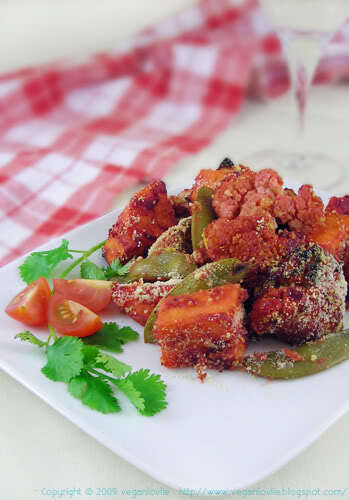 Add 1 tablespoon minced ginger and let it sizzle for about 20 seconds. Then add in about 1/3 of the total amount of rice (about 1 cup). Stir fry continuously and try to coat every grain with the oil. Allow the rice to dry out a little then add 1 tablespoon soy sauce. Continue to stir fry for a few minutes. Add another cup of the cooked rice and mix well. Stir fry for a few minutes then add a little soy sauce again. Finally add the rest of the rice. Add a couple pinches of Indian black salt and a few dashes of ground black pepper. Stir fry for 2 more minutes. Remove from the pan and set aside on a large plate to cool. Let the rice cool completely once again. Meanwhile we can start to stir fry the vegetables. In the same wok/pan (with the heat medium-high), add 1 teaspoon coconut oil. Add in the carrots and cook for 2 minutes. Then add in the broccoli and green beans. Cook for another 3 minutes. 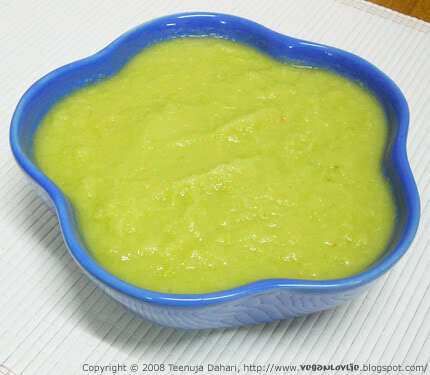 Add the frozen peas and sweetcorn. Cook for about 1 minute. Then add the bok choy. Add 1 tablespoon of soy sauce and a few dashes of ground black pepper. Continue to stir fry the vegetables for another 1 minute. Now add in the cooled rice. Stir and mix everything well. Add the sweet paprika, lemon juice and maple syrup. Mix well and adjust salt if required. Garnish with some chopped chives or green onions. Serve warm with your favourite hot sauce (I recommend Sambal Oelek). How sweet of Kevin to share a special dish! Thanks for sharing such a lovely story about you guys! 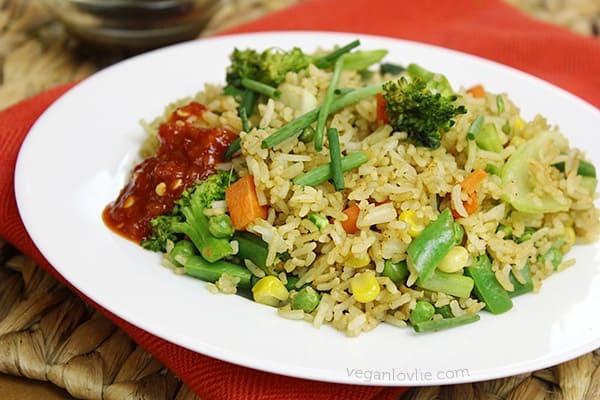 I love fried rice, it's great as leftovers as well as using leftover rice! 😉 Looks fantastic, Teenuja!